Today, I’m posting from my satellite office, a particle board desk in a midland hotel room in Miami, FL. BK and I were awarded a governor’s pardon from the land of mushrooms. The decree said, “Go, clear your sinuses of the odiferous offenders.” The poor Shroom house, I joke about it in good fun, (okay, okay, so I’ve been a little harsh, but in my defense, poop smells are not something you would elect to add to your reality. Trees, check; flowers, check; scent of an outhouse, check. Sounds like a recipe for nirvana if you ask me.) But, seriously, to categorize the little house we’re renting as anything less than the perfect space would be unfair. Is it a Houzz worthy property, hardly. But there’s something a little magical going on there. I’m almost afraid to move into the new house when the time comes, I don’t want to lose the vibe. (More on that later.) The real reason for our trip to Miami was to visit Shay and Luke. Our original plan was to go in July, but sometimes we just need to see the kids, (and I think they need to see us too,) so our trip was happily moved up. Making time to connect with our touchstones is akin to breathing. 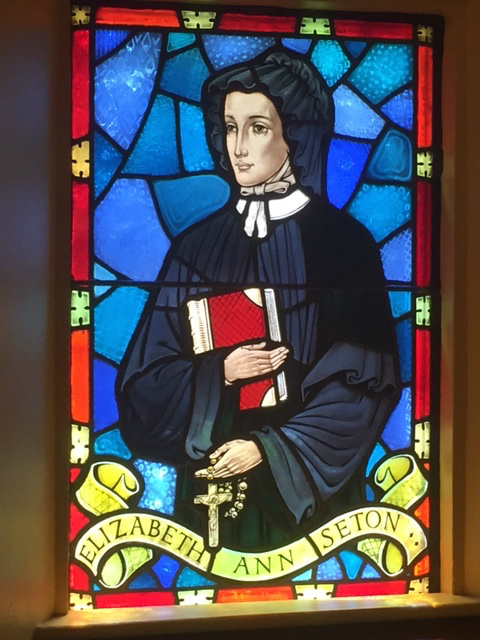 Elizabeth Seton and I are connected. With a strange and miraculous beginning. While my brother, Tim, was fighting through his cancer decline, I was a fledgling actress in a college theatre department. For our senior thesis, we had to create and perform a mono-drama, based on a person or event from history. It could be recent or past history; but whaterever you picked as a topic, you had to do the entire thing by yourself. We had to declare our topics in our junior year and I was the stumped straggler. I had no idea what to do. Everyone else in our department had already turned in their paperwork and were contentedly researching their subjects. Me, I was spending every extra hour beyond school and work at the hospital. When you know a family member is dying, it changes your priorities. Tim had been doing poorly and the hospital told us to gather our family, (which was no easy task since they had to come from California and Virginia.) We had all come together and it looked like that night would be the end. His blood pressure had dropped down to lifelessly low numbers, his heart was shutting down. My Mom was collected but panicked. She wasn’t ready to lose Tim, I could see the desperation on her face. She excused herself and went to the library on the floor of the cancer ward to be alone. About ten minutes after her departure, a whirl of activity went into motion. We were moved out of the way and several nurses gathered at Tim’s bed. The Charge Nurse, who’d become a friend, (spending two and a half years in and out of a hospital tends to breed familiarity,) whisked past us as we hovered in the door frame and said, “It’s a miracle.” I ran to get Mom. Inexplicably, Tim had rallied. When I told her, she seemed quietly resigned to the news and quickly made her way to his bedside. Before long, Tim was sitting up in bed drinking his ever-present orange Gatorade. It was astonishingly improbable. When all the commotion settled down and his new status was confirmed, my Mother asked to talk to me in the hallway. She said, “You need to pick Elizabeth Seton for your one-person show. I just prayed for her intercession to keep Tim with us a little longer and she heard me. You need to do this for her.” I had no idea who the woman was, the only reason I knew the name was because my Mom had attended Elizabeth Seton High School and talked lovingly about her alma mater. But, if she said I needed to do it, I believed her. I declared the next day. It didn’t take much research to realize I’d hit the jackpot of personalities, the woman’s life was a dramatic smorgasbord. I mean, for heaven’s sake, she was canonized the first American saint. You can imagine. By the time my senior performance rolled around, almost a year later, the show was a hit, with a humbling ovation that went on forever. I left the theatre on cloud nine and, under the watchful eye of a brilliant full moon, made my way to the hospital to share the victory with Tim. It was one of my favorite nights with him. He passed away one month later. After college, I worked for a little while, but when the kids came along, my theatre career took a backseat. That was no life for a woman who wanted to be obsessed with her family. But the one thing I was able to do was continue to perform that mono-drama on weekends, while BK stayed home to watch over the brood. It took me to far corners of the U.S. and even a trip to Canada. Mother Seton, (as she was lovingly called,) had been good to me. Then, some twenty years ago, because of a work transfer, we moved the family to a small town outside of Baltimore and one of the first things we noticed when we explored our new digs was a random, solitary green state sign on the main drag, announcing a single location, Emmitsburg, 30 miles. Emmitsburg is the home of Elizabeth Seton. That’s how we found the grotto. One of my favorite images of being there happened when the kids were just wee little people. We had come up on a statue of St. Francis Assisi, (they were drawn to this kindly looking man with the animals perched on his shoulder and in his arms,) and we called for a family hug. It was a private area and there weren’t many people there so it didn’t seem out of place. BK and I surrounded the kids and each one of us, starting with the youngest, said our necessary line, “I’ve got everyone.” One by one we all announced that we had positioned ourselves in a way that we were literally touching each person in the family. It is a memory that I’ve conjured, pretty much every day, for the last twenty years. The peace I was looking for greeted me as soon as I walked up on the stone pillars of the entrance. There’s a beautiful statue of Jesus with his arms stretched open and a small plaque that says, “Come to me all you who labor and are burdened and I will give you rest.” A welcoming start. I followed the main path to a little stone chapel that leads to the grotto. It’s a micro-chapel, only holds about 12 people (and that would be crowded.) But it’s definitely worth stopping in. Four stained glass windows flank the tiny structure; Elizabeth Seton is among the dedications. The image above is her window. When I got to the actual grotto, I was taken by a woman holding a sizable bouquet of gorgeous red roses. She had brought everything she needed to set up a thoughtful offering at the foot of the alter. After she carefully prepared the vase, she went into the cave area, prayed, and lit a candle, then called her children in to put the money in the offering box. When she emerged, I thanked her for letting me take pictures and we ended up sitting down to talk. This delicate woman, who seemed the epitome of the devoted Christian, was a Buddist. I asked her how Buddists felt about Christ and she said all religions had something special to offer, that we’re all interested in achieving the same end. This soft-spoken woman, Tuyen, had been raised a Catholic, but had embraced a new direction. We talked about how fruitless it was to look at our differences, and instead agreed that the goal should be to look at our similarities. We all want the same thing, love. After I left them, I went and sat on a big rock that stands guard between the grotto and the chapel. A perch Mother Seton sat on to teach the children in the school she built back in the 1800s. I always sit on her rock, I owe her a debt of gratitude that goes beyond words. It felt good to look up at the mammoth trees that border that section of the grotto and know they’ve seen us both filling that space. The last stop was the spring and reflecting pool. There’s a stone platform with an upright tablet that houses a faucet that runs continually. It’s fed from the spring that runs past the grotto. People used to fill all matters of containers to take the water home to drink, but there are signs now that say, “Don’t Drink the Water.” I’m sure liability is at the root of that. Our litigious society finds its way into everything. I have taken containers home before, but obeyed the rules and left my jug empty. I let the water run on my hands and arms, and relished the cold comfort. The reflecting pool next to the faucet is fascinating; it’s a circular structure with a exquisite statue of Mary hovering in the center. Money sprinkles the bottom of the pool, it used to be only coins, but now, there’s paper too. On my way out of the pool, I ran into a sweet young couple who had come up from Baltimore to walk the grounds. That’s no short trip, it took them the better part of an hour and a half, I’m sure. The young man, Davis, had been once before, when he was a younger. But the young woman, Siena, had roots. Although she said she hadn’t been in several years, she had spent a lot of time visiting as a child. At one point I made a comment about how beautifully the place had grown over the years and how admirable all the donations were. (Everything there has been donated by someone; what you walk on, what you sit on, what you gaze at.) She said she knew that commitment in a personal way, that her family had donated one of the mosaics. I felt privileged to have met her, the mosaics are stunning. The “more on that later” comment in the opening will have to wait. I’ve babbled quite enough already. (This is my longest blog to date, thanks for sticking with it.) I’m glad I went to the grotto. The world can be a harsh place, I’m grateful there are places to escape from all the madness. Places that feed the soul. Thanks Elizabeth, thanks for the touchstone.